I'm pleased to announce that I am a Round One judge for the Cybils Awards in the graphic novels category. I was a judge in the same genre for the 2011 awards and it cracked my knowledge of graphic novels wide open. Having lived overseas since then, I was unable to judge until now. Get ready for a lot of graphic novel reviews! I'd heard lots of chatter about how good The Prince and the Dressmaker is, but had no idea what the plot was. The cover made me think it would be a Cinderella tale, so imagine my surprise when I learned that the titular prince enjoys wearing dresses and the dressmaker is hired to hide this part of his identity. Jen Wang's illustrations drew me in with their warmth; I especially loved the attention to the expressions of all characters, even just in the background. I also enjoyed the different outlandish costumes that the dressmaker designed. 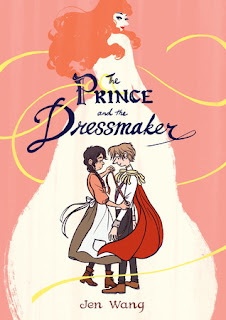 There is a real push for more books that help readers feel seen and The Prince and the Dressmaker will be that book for many. I especially loved the ending and the refreshing acceptance it shows. What a fun start to my renewed graphic novel reading!